Damage to teeth, such as cracks and decay, can often be found by your dentist during an exam. Many times, however, tooth damage can be hidden between teeth or under old dental work, and can only be detected with the use of technology. This is where dental x-rays are very helpful. Typically, when you have healthy teeth and gums, 4 check-up x-rays called bitewings are taken once a year. These x-rays are performed simply to catch potential problems in their infancy. They work as a proactive measure in defending patients against diseases such as cavities and periodontal disease. If, on the other hand, you have a history of tooth and gum problems, you might need x-rays of your teeth each and every time you go to the dentist. Not only will these x-rays detect problems in their infancy, they will be used to monitor the progress of past procedures. There are many different kinds of x-rays that are taken of the teeth. The most common type of dental x-rays are intraoral x-rays, which take place inside the mouth. When these x-rays are being performed, a small sensor is placed into the patient’s mouth, and is clenched between the teeth as the image is taken. There are three primary types of intraoral x-rays: bitewing, periapical, and occlusal. Whereas bitewing x-rays are used to assess bone loss and decay between teeth, periapical x-rays are used to assess changes in the roots of the teeth. Occlusal x-rays, on the other hand, are used to assess the growth of new teeth. Extraoral x-rays cover a variety of different types of x-rays. These include everything from panoramic x-rays, to tomograms, to cone beam CTs, to digital imaging, to MRIs, and more. The type of extraoral x-ray that you receive will depend largely on your dentist. Generally, these x-rays are used to detect entities that cannot be seen with intraoral x-rays. These entities include everything from tumors, to impacted teeth, to fractures, and much, much more. Dental x-rays have traditionally been taken with film, but more and more offices have made the switch to digital x-rays. Here at Dental Innovations, we utilize digital x-rays for all of our patients. Digital x-rays give us immediate results (no waiting for the film to develop). We are able to instantly share the results of your x-rays on a screen during your exam so you and the doctor can discuss the findings together. Digital x-rays are easy to transfer and offer less radiation. 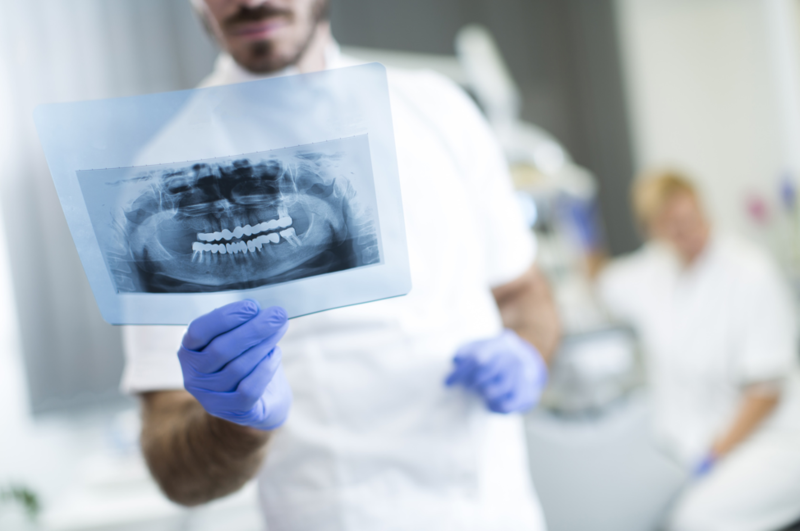 Like all x-rays, dental x-rays involve the use of radiation. Those who undergo teeth x-rays will be exposed to this radiation, however, the amount of radiation that is used is very miniscule. Looking to Take Advantage of Teeth X-Rays in Chicago, Illinois? Are you interested in scheduling a dental appointment? Are you looking to take advantage of teeth x-rays in Chicago, Illinois? If so, Dental Innovations has you covered. Our team of friendly and welcoming dental professionals is well-versed in performing dental x-rays. We can’t wait to see you. Schedule an appointment by contacting us now!